Komodo National Park, , is in the Nusa Tenggara region of Indonesia. Komodo National Park lies in the Wallacea Region of Indonesia, identified by WWF and Conservation International as a global conservation priority area, and is located in the center of the Indonesian archipelago, between the islands of Sumbawa and Flores. Komodo National Park includes three major islands: Komodo, Rinca and Padar, as well as numerous smaller islands creating a total surface area (marine and land) of more than 1,800 km2. 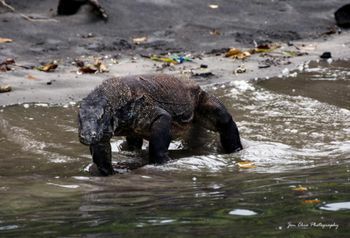 As well as being home to the Komodo Dragon, also known as the Komodo Monitor, or Ora (to Indonesians), the park provides refuge for many other notable terrestrial species. Moreover, the Park includes one of the richest marine environments. Paket Wisata Pulau Komodo National Park was established in 1980 and was declared a World Heritage Site and a Man and Biosphere Reserve by UNESCO in 1986, both indications of the Park's biological importance. The park was initially established to conserve the unique Komodo Dragon and its habitat, first discovered in 1910. Since then conservation goals have expanded to protecting its entire biodiversity, both marine and terrestrial. The majority of the people in and around the Park are fishermen originally from Bima on the island of Sumbawa, and from Manggarai, South Flores, and South Sulawesi. Those from South Sulawesi were originally nomadic and moved from location to location in the region of Sulawesi to make their livelihoods. Descendants of the original people of Komodo still live in Komodo, but there are no pure blood people left and their culture and language is slowly being integrated with the recent migrants. Little is known of the early history of the Komodo islanders. They were subjects of the Sultanate of Bima, although the island’s remoteness from Bima meant its affairs were probably little troubled by the Sultanate other than by occasional demand for tribute. The number of terrestrial animal species found in the Park is not high, but the area is important from a conservation perspective as some species are endemic. Many of the mammals are Asiatic in origin. Several of the reptiles and birds are Australian in origin. These include the orange-footed scrubfowl, the lesser sulpher-crested cockatoo and the nosy friarbird. The most famous of Komodo National Park's animals is the Komodo Dragon (Varanus komodoensis). It is the world's largest living lizard and can reach 3 metres or more in length and weigh over 70kg. Other animals include the Timor deer, the main prey of the Komodo dragon, wild horses (kuda liar), water buffalo, wild boar (babi liar), long-tailed macaques, palm civets, the endemic Rinca rat (tikus besar Rinca), and fruit bats. Also beware of the snakes inhabiting the island, including the cobra and Russel’s pit viper, both of which are extremely dangerous. As far as the marine fauna is concerned, Komodo National Park includes one of the world's richest marine environments. It consists of over 260 species of reef building coral, 70 different species of sponges, crustaceans, cartilaginous (incl. manta ray and sharks) and over a 1,000 different species of bony fishes (over 1,000 species), as well as marine reptiles (incl. sea turtles), and marine mammals (dolphins, whales, and dugongs). Tropical all year round, and both extremely hot and dry (> 40 degrees Celsius) during August and September. The ferry service (to and from the cities of Sape, on the eastern tip of Sumbawa, and Labuanbajo, on Flores) drops off passengers on Komodo once or twice every week. There is no port on the island, so passengers are unloaded onto small vessels which take them into the island's only village. (Note that not all departures have this service -- check beforehand.) Bima, a short drive from Sape, has an airstrip with flights to Denpasar. Additional fees include activities (eg. diving is 25,000 IDR, snorkeling 15,000 IDR), research and documentation for commercial purposes. On land: On foot, only, as there are neither roads nor motor transport. On sea: By chartered boat, only, as there are no regular connections. You may wish to wear long pants, sunglasses and a hat as you walk in the interior. The main reasons to travel to Komodo National Park are the Komodo Dragons, the superb beaches and the unspoilt corals. Keep in mind that there are also wild pigs, monkeys and horses on Pulau Rinca, one of the two largest islands in the park. If you return by sea at night, you can also see legions of flying foxes (fruit bats whose wing span may exceed 4 feet) flying in the twilight sky. At night on the Flores Sea, you also have a magnificent view of the stars. Depending on the time you have available, one or more guided tours on the islands of Rinca and Komodo itself. Please note that it is neither permitted nor advisable to do any tours without local guides, as the Komodo Dragons are dangerous when they attack. 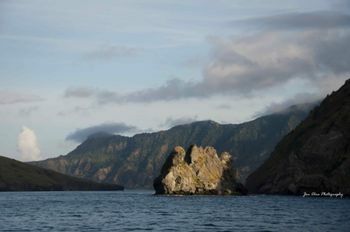 This area is inhabited by more than a thousand different fish species, making it one of the world’s richest marine habitats. You may also swim in the Flores Sea on your incoming or outgoing boat trip to one of the islands. Beware of sharp corals on the sea floor near some of the small islands. Komodo National Park offers divers (and snorkelers) an overwhelming variety of marine life. As part of the “coral triangle” this is the richest concentration of marine life in the world. The diversity of dive sites is almost unparalleled with warm, gentle reefs with hundreds of species of colorful fish and corals to the crazed excitement of sea mounts with huge currents and massive pelagics like Manta Rays and Sharks. On Pulau Rinca near the park headquarters you may buy hand carved wooden komodo dragons along with park stickers and park t-shirts. Prices may be cheaper in Labuan Bajo, Flores than on Pulau Rinca. A limited selection of food is available near the park headquarters on Pulau Rinca, and the prices are not high by Western standards. Under no circumstances drink any tap water. The tap water is not potable. Near park headquarters on Pulau Rinca, you may purchase water and soft drinks. If you go trekking into the island's interior be sure to take a large bottle of water with you. You will need it! There is a 7 US dollar a night losmen in Labuan Bajo, Flores. The Komodo Islands are made famous by the greatest lizard on the planet, the Komodo Dragon. But the Komodo chain of islands offers so much more than this. Pristine reefs, uninhabited islands, white sandy beaches, marine life second to none and land life as fascinating as the Dragon itself. Many of the islands in the chain are either inaccessible to large boats or difficult to access. However with a sea kayak, we can travel anywhere we like. Into small grottos and bays, around rocky points and slowly above shallow reefs brimming with fish. The Komodo Dragon has a history of attacking humans. Beware of getting too close, and if you are visiting via the park's office (which you should), ask for a guide and stick close to him. Do not wander off or do anything without his consent. Komodos may approach the guest rest area during daily feeding time, but in this time, find a building (which are usually elevated) and stay clear from the railings. Komodos can and will jump to obtain food if necessary. Park rangers are usually present at these events and will deflect any Komodos trying to get in (which they can do). You may be given a large pole with a split on the end, forming a "Y" shape. This can be used as a walking pole or for moving things on your path - however, if wild animals threaten, it can be used as a last form of defense (despite being hardly useful against Komodos). Overall, try keeping a watchful eye and steer clear of any wildlife. Komodos are extremely dangerous if close enough. They can run faster than humans (and accelerate very quickly), so best not approach if necessary. Jumping into water (as Komodos are often found near the beach too) doesn't help either, as they can swim faster than humans, can dive, and can also swim against strong currents (in fact, sometimes Komodos are found on neighboring islands, suspected of swimming there). Zoologists formerly believed that the main problem was the dragon's diseased-filled bite from the rampant bacteria residing in their mouth. 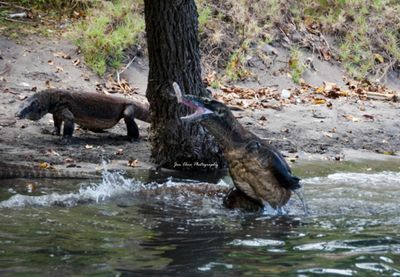 More recently theories have been put forward that the Komodo Dragon is actually venomous, and that the biggest problem when bitten is shock and massive blood loss due to the ferocity of the bite. Whichever, getting bitten is not a good thing. The absence of crocodiles on Komodo Island (due in part to a lack of suitable habitat) leave the Komodo Dragons with no natural predators. Younger Komodos may live in trees. While not as dangerous as their parents, they can still jump off suddenly and cause panic. Snakes, monitor lizards, and other animals are also present and may cause minor problems. Saltwater Crocodiles are not present on Komodo Island but they may be present on the surrounding islands and in the ocean. Any area with estuaries and river mouths should permit extra caution as, although they are technically not present on Komodo, the islands ARE within the species natural range. It was once believed by Indonesian natives that monitor lizards (including the Komodo dragon) were capable of warning humans of a crocodile's presence. Bali - the Island of the Gods is two hour's flying time away and is a popular combination trip with Komodo. This page was last edited on 30 August 2018, at 14:14.